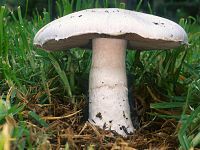 Agaricus is a genus o mushrooms containin baith edible an poisonous species, wi possibly ower 300 members warldwide. ↑ "Synonymy: Agaricus L., Sp. pl. 2: 1171 (1753)". Index Fungorum. CAB International. Retrieved 2013-08-29. ↑ Bas C. (1991). A short introduction to the ecology, taxonomy and nomenclature of the genus Agaricus, 21–24. In L.J.L.D. Van Griensven (ed. ), Genetics and breeding of Agaricus. Pudoc, Wageningen, The Netherlands. This page wis last eeditit on 20 Juin 2014, at 13:42.